« Do Women REALLY Talk Too Much? Highwaymen were one of the scourges of the eighteenth century. They would often lie in wait in Hounslow Heath waiting for a carriage of some description to pass by, and then their voice would be heard, gruff and unabashed, “Stand and deliver!” If the driver had not had the forethought to fire his blunderbuss to scare off the robber, he would have to pull up the equipage. The highwayman, usually with by an accomplice, would then take any jewels, money or other valuables from the occupants of the carriage. The fate of a highwayman, once captured, was usually Tyburn – hung by the neck until dead. James Macleane was one of these highwaymen. What distinguished him from the majority of the others of his kind was that he was known as “The Gentleman Highwayman”, due to his polite manner of speaking and his wearing a Venetian mask during robberies. James Macleane was born in Ireland in 1724, and was the son of a Scottish minister. At the age of 18 he took his modest inheritance to Dublin where he squandered it all on clothes, prostitutes, and luxury living. He moved to London with the intention of entering into military service, but instead married a tradesman’s daughter and opened a grocery shop near Cavendish Square. His wife died shortly after and he sold the stock of his business, hoping to recoup enough money to follow his initial plan of entering into the military. Some of his friends helped him gather some funds to enable him to ship himself off for Jamaica, but he gambled it away. Macleane then paired up with an apothecary, Plunkett, whose business had also failed, and began his career as a highwayman. By day he passed himself off as a gentleman of some means, purporting to earn 700l. a year and living in St James’s Street, in the hopes of attracting and marrying a rich heiress. During his career, he managed to hold up several people of notoriety. One of these was Horace Walpole, whose carriage he stopped in Hyde Park one night, stealing his gold watch. On this occasion, his pistol accidentally discharged, grazing Mr Walpole’s cheek before going through the roof of the carriage. 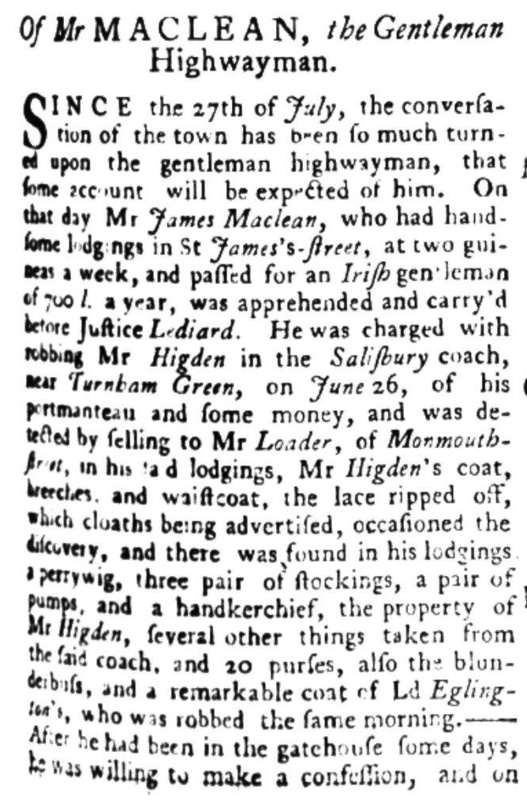 The crime that led to his arrest was committed on June 26th, 1750, when he held up the Salisbury Coach, near Turnham Green, and stole some items of value from Mr Higden. That same day he also robbed Lord Eglington, stealing his blunderbluss and coat. Macleane was caught the following day when he tried to sell the clothes and lace from one of the coats he had stolen to a pawnbroker. The clothes had been advertised as stolen, and the pawnbroker, recognising them and suspecting foul play, alerted the authorities. Plunkett somehow managed to remain hidden and was never apprehended. After a few days in the Westminster gatehouse, Macleane was taken before the Judge and gave a confession, which he later retracted in his statement of defence at his trial. The Gentleman’s Magazine reports that women were weeping during his statement, when they saw the accused “appeared so concerned”. His trial was conducted in the Old Bailey, and was the subject of much interest, with the courtroom being unusually full. Indeed, he was reported to receive a massive 3000 visitors in Newgate prison while he was there! 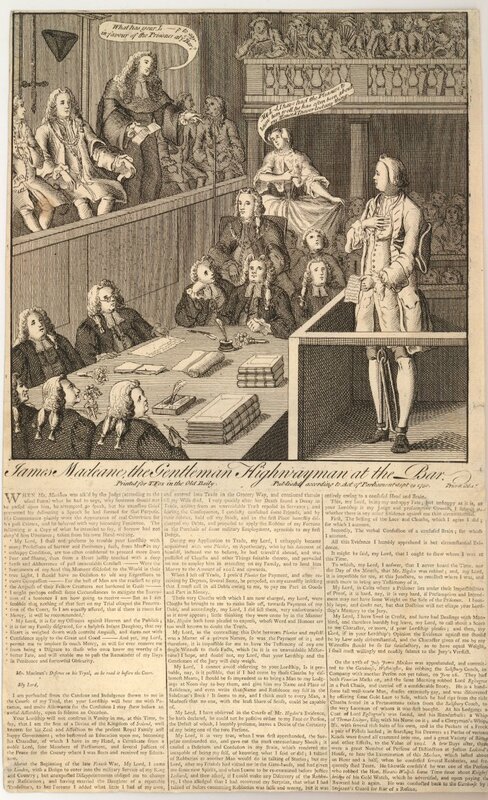 A print was published depicting Macleane’s trial (see left), where the panel of judges sits at the left and Macleane on the right. The judge says: “What has your Lady to say in favour of the Prisoner at the Bar?” To which the woman standing at the back replies: “My Lord, I have had the Pleasure to know him well, he has often been about my Home. I never lost any thing.” The text, printed in three columns below the picture, contains a description of Macleane’s response to his guilty verdict, his statement of defence, a description of the case against him, and outlines some aspects of his confession. During his defence, he asserted that his supposed accomplice, Plunkett, gave him the clothes to sell on account of there being some money that he owed to Macleane. He discounted the evidence he gave in his earlier confession by saying that it was one that sprung from a confused and disordered mind. Macleane then called nine men to the stand to give evidence to say he was of reputable character. Despite this, the jury – without even having to leave the courtroom – found him guilty. In the week after his trial – and before his death – he confessed that his defence “was by the advice of an attorney, that he thought it a just defence in law; and that, if it had preserved his life, it would have prevented the disgrace, which his death would bring up on his family, and would have afforded him an opportunity of making some reparation to society, by becoming a useful member of it, and of proving the sincerity of his repentance by his reformation” (Gentleman’s Magazine, Oct 1750). The Gentleman’s Magazine, through a Dr Allen’s account, describes his sorrows and the anxiety of waiting for his death. Macleane seemed to show all the true signs of repentance and remorse, bursting into tears and praying earnestly for forgiveness. In essence, he appeared to be the sort of man who, for want of occupation, fell into gambling and idleness, which added to his troubles. He spent more than he could earn, until the only way to maintain his standard of living was to resort to robbery. He was hung at Tyburn Tree on 3rd October, 1750, where a crowd of 110,000 gathered to watch. There had even been a small stadium built so the viewers could watch executions in comfort, and often fast food vendors were present to feed anyone feeling the least bit hungry during the entertainment. The final caution: “Let those therefore who are yet innocent make no approaches to the precipice from which this man fell, and let those whose crimes have not yet been detected hasten from the brink” (The Gentleman’s Magazine, Oct 1750). Capital punishment for relatively minor crimes, as was the fashion in the 1700’s, is not really my cup of tea, but interesting none-the-less! The Gentleman’s Magazine, Sept 1750. The Gentleman’s Magazine, Oct 1750.